Of course, the “rights of man” have been a central component of western political theory for centuries, particularly in relation to the protection of property, but, as Moyn points out, this is quite different from human rights as it is understood today. The former were invoked to allow a people to found a nation-state, whereas the latter are often used to police someone else’s. Moyn argues that the prevailing mistakes over history do not end there. The misconception has expanded so that it is now assumed that “since their birth in a moment of postgenocidal revulsion and wisdom, human rights had become embedded slowly but steadily in humane consciousness in what amounted to a revolution of moral life”. The real story, he suggests, is that human rights as a concept effectively died for its first few decades in existence. Simply, nobody cared about human rights until at least the 1970s, and there was certainly no strong international human rights movement. It is therefore a “true puzzle” why they have recently been born again. 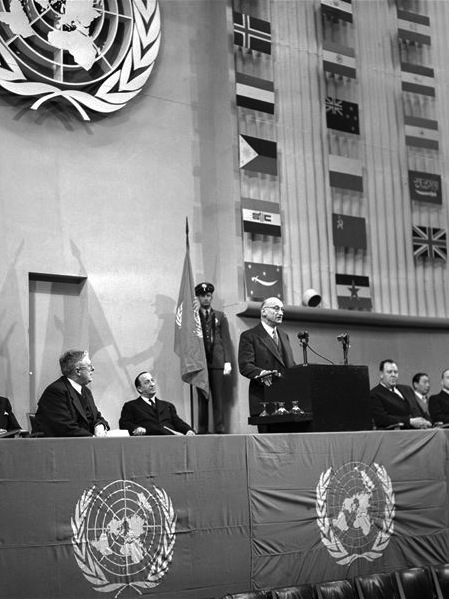 Another quandary is why social and economic rights, which were, in the mid-1940s, central to the human rights doctrine, have now receded into the background at the expense of rights couched as ‘protections from’; for example, torture or retrospective punishment (this evokes Isaiah Berlin’s concept of ‘positive’ and ‘negative’ rights). What actually happened is that the concept of human rights was subsumed during the Cold War – particularly in the 1950s and 60s – by the very movement it had been invented to replace. The continuing disintegration of the old empires, alongside the fracturing of the socialist project , meant that nationalism was again on the rise. By the early-1970s, there were no truly visible Non Governmental Organisations (NGOs) with human rights agendas, and the concept was yet to take off. This was all to change during that decade, however, when NGOs began to use human rights to mean individual protection against the state. Amnesty International, until then a largely invisible organisation, won the Nobel Peace Prize in 1977. It is no surprise that this was the same year of Jimmy Carter’s now famous declaration. At this point those involved in international activism in the West reinvigorated the simple, universal and idealistically non-political concept of human rights, “envisioning an international law of human rights as the steward of utopian norms and the mechanism of their fulfillment”. Foreshadowing Barak Obama’s retraction from his predecessor’s use of human rights to justify a foreign invasion, Jimmy Carter sought to escape Henry Kissinger’s harshly realist, practical foreign policy by invoking the idealistic concept of human rights. Human rights were an idea whose time had come. What mattered most, Moyn argues, was the collapse of universalistic system such as communism and the construction of human rights which appeared to be “minimal, individual and fundamentally moral, not maximal, collective and potentially bloody.” They were in essence, and have remained, an ideology for the post-ideological age. Why does it matter where human rights come from? First, it matters in the somewhat glib sense that those who do not understand history – in this case the widespread disillusion and unpopularity of human rights for the first three decades – are doomed to repeat it. Second, it matters because misinterpreting the history of rights is likely to lead to mistakes in their application, and also to an inability to assess properly the successes and failures of similar systems. Human rights, particularly in the international sense of interfering with other states and societies, is an ideology like any other, and not an “inviolable consensus everyone shares”. This is not to equate human rights with pernicious ideologies such as communism, but concepts do need to be properly defined because, as Moyn points out, if “they promise everything to everyone, they can end up meaning anything to anyone”. misled a generation of young activists into believing that, conventional avenues of change being hopelessly clogged, they should forsake political organization for single-issue, non-governmental groups unsullied by compromise. In the UK, unlike in the US, human rights have been enshrined in law by the Human Rights Act which guarantees rights found in the European Convention on Human Rights. This is not to say we necessarily have stronger human rights protections; the United States Constitution arguably shields citizens ‘from’ rights violations more vigorously than our own law. However, we are in the position of being able to properly compare domestic and international human rights. To compare the two, one instantly hits upon the Human Rights Act’s most basic limitation; human rights court actions can only be brought against public bodies. This is a compromise which at its heart accepts that only public bodies – rather than individuals – can be expected to be responsible for an individual’s human rights. Put another way, only the instruments of the state are powerful and pervasive enough to guarantee such rights. I can no more be expected to ensure my neighbour’s human rights than I can be to make her breakfast or make sure her roof isn’t leaking. Following this logic, the UK courts have been very slow to expand the state’s human rights reach beyond the UK borders – for example ruling that the Human Rights Act does not apply on the battlefield in Iraq – or to increase the range of groups which are “public bodies” within the meaning of the Act. The essential realisation which arises from the public/non-public limitation is that the further one reaches from the UK, the harder it is to make any real change from a human rights perspective.It is arguable that what the Government can be expected to achieve in foreign nations, where it has little or no influence over the mechanics of a state, in human rights terms is so much less than it can at home, and therefore every penny should be ploughed into our own justice system. Our new Foreign Secretary has commitment to put human rights at the “irreducible core” of our foreign policy has been questioned in recent days with the potential reduction in scope of the Foreign Office’s annual human rights report. But perhaps there is little which can really be achieved internationally and the money represents rhetoric rather than reality. Cutting off international human rights support would be too extreme, however, as the UK can undoubtedly have a positive influence over governance abroad through trade and international development, and this should remain a foreign policy aim. But this does beg the question as to how much time, effort and money should go into international “human rights” promotion when our own justice budget is being cut by 20%. It seems somewhat absurd that money should be spent on foreign justice systems if our own is not fit for purpose. More fundamentally, human rights should not be seen as a post-political or non ideological solve-all; rather, they are legal instruments which can only be properly enforced by a willing state. Moreover, a proper examination of the history of human rights may help clarify what they should mean going forward, and whether in the hard times ahead our domestic human rights protections should expand to include social and economic rights, as was intended when they were invented. I say the ‘rights of women’ have never featured other than as a peripheral component of western political theory, (not least because women were, within living memory, categorised as property requiring protection) but that doesn’t mean widely popular women’s rights movements, and also women’s movements relating widely to human rights issues (especially war), did not happen. They just got ignored. Isn’t it important to stop telling only half the story?